This part was highly structured as participants were prompted to agree or disagree without elaborating further, although some have commented very briefly upon their disagreement. The absolute majority of participants are aware of their respective section objectives with the exception of one who, nevertheless, admitted that objectives must exist. 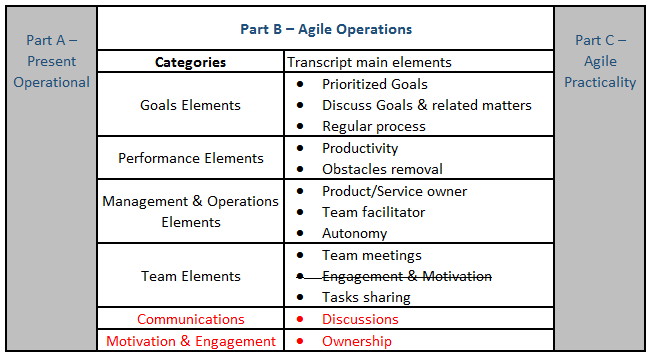 The general awareness of goals and objectives which respondents demonstrated in the first part facilitated the introduction of Agile concepts throughout the interview process. Similarly, the majority of participants agree that objectives change on regular basis. The public service is not immune to the continuously changing environment. Most participants reverted that the main change is in prioritization of objectives and tasks, while only three experience stable objectives and unchanging prioritization, two of which belong to lower grades (scales 14 and 15). 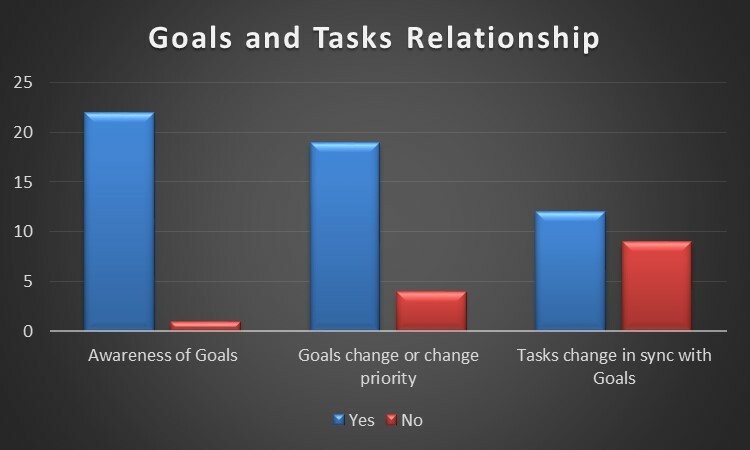 Only 12 participants highlighted that their daily tasks change or change priority in line with changes in the sections’ objectives or prioritization. On the other hand, one participant admitted that within his department tasks are out of sync: ‘No, I am not aware but tasks changes happen according to my superior orders’. The analysed data indicates that in general, questioned public servants are aware of their sections’ objectives and these change or change priority often. However, only half of these respondents believe that tasks changes occur in line with the changing objectives or re-prioritization of same. This context provided an excellent basis for Agile concepts which were analysed in part B. 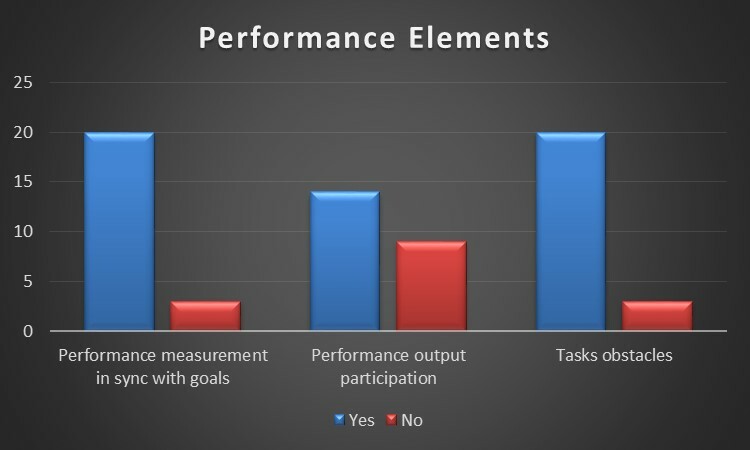 In general, participants agreed that performance assessments are measured in relation to section objectives. However, only 14 participants out of 23 engage in discussions within their respective sections about operational performance and output enhancement. 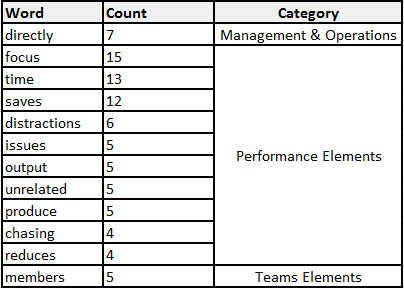 11 out of these 14 respondents highlighted their participation in performance talks as a team, whilst the remaining 3 participate individually with their superiors. This data also provided good basis for part B of the interview. As depicted in figure 4.2, only 3 out of 23 participants articulated that they do not tackle obstacles outside their remit. The rest replied with a resounding yes, indicating that it is the norm to pursue employees within other sections to solve issues which are impinging on their work and section performance. The following interview questions focused on the daily operations such as, current practices on setting tasks’ deadlines, decision making autonomy and testing whether standard operational practices for sharing workload and knowledge are in place or not. 8 participants reverted that they have in place standard operating practices within their section. Allowed to comment further, participants expressed themselves as follows: ‘Yes, in the process of formalizing a practice’, ‘Yes, but not applicable to all staff within the section’, ‘Yes, via a generic email address’. Other comments reveal that there is no defined formal practice that applies to all sections. In general, participants said that their assigned tasks have fixed deadlines and there is hardly any consultation as these are normally imposed on them. With the exception of a few participants who mentioned that not all tasks carry a fixed deadline, only 4 participants replied that they are consulted but only for internally initiated tasks. 9 out of 23 declared that they are allowed to take decisions within their remit while the rest only mentioned minor or ad hoc instances of decision-making responsibility. In general, all respondents have to refer to their superiors. 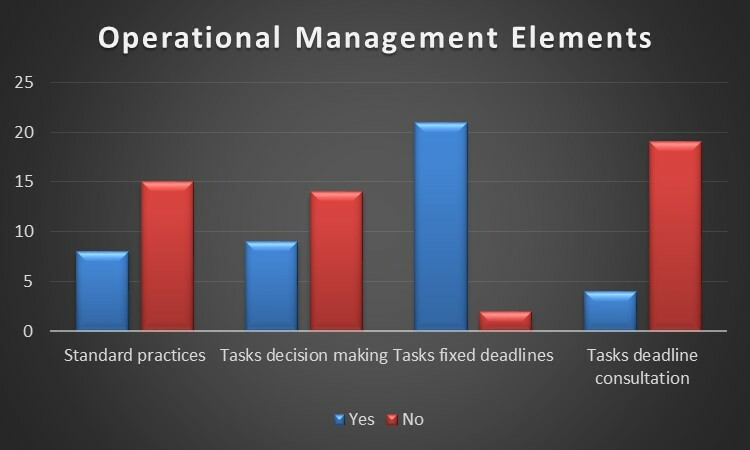 The operational context as explained by participants indicates that tasks are bound with fixed deadlines, while public servants are not consulted when fixing such deadlines. The public service context has a mix of inconsistent and ad hoc standard operating practices and decision making practices. Participants are able to work as a team, although most of them stated that it depends on the nature of tasks. Mostly, work individually on specific jobs and as a team when requested to do so. Only 5 admitted that they do not work in teams. The majority admitted that they have team or section meetings to discuss tasks, objectives and issues. This is very positive, however, only 6 participants said that they do it on a regular basis and in a formal way, the rest do it informally, on ad hoc basis and as the need arises. All participants said that their work can be shared by others in the section, although this does not always happens. The only exception is with some specific tasks related to higher scale roles such as, Directors’ sensitive specific duties. As described by the participants, the work context allows public servants to work in teams, share their work and meet regularly to discuss operational performance. However, currently there are no formal practices in force and therefore such team meetings are carried out on an ad-hoc basis. Following Part A, I simulated an Agile scenario to participants via a brief description focusing on the themes listed in table 4.2. All participants apprehended the approach, understood the simulation and engaged positively in the research study and although they knew that this was just a simulated environment, I was impressed with their engagement and willingness to contribute. The process of attaching meaningful chunks of data to the pre-determined category codes also included the quantification of the qualitative data (where applicable), by counting the frequency of positive and negative replies. In this part of the semi-structured interview, participants were allowed to express themselves, irrespective of the nature of the answer, by elaborating further upon their reply. This meant that units of data were not only attached to the pre-determined and respective categories but also attached to other or even new categories. The first element under this category dealt with the presentation by the sections’ objectives (product/service) owners of a list of objectives with priorities. The second element dealt with whether they perceive any benefit/s if this process (including the re-prioritization of objectives and related tasks if the need be) is repeated on regular intervals that is, every work cycle. Whilst, the third element focused upon the benefits, if any, which participants perceive if they are allowed to discuss the listed objectives, tasks, achievements, pending matters and prioritization of tasks during such meetings. Out of 69 replies, only one negative reply was recorded. In fact, while, this participant agreed with the regular presentation of objectives and priorities, and space for discussing these matters, he/she disagreed with the frequency of such meetings by replying “No, I think it is too frequent”. Participants’ main arguments did in fact feature the goals’ aspects per se as expected, but also extended to other categories such as, management and operations, performance (productivity) and teams. Additionally, new category codes emerged which I detached from the pre-determined ones. The proposed methodology about objectives and tasks delivery, related discussions and timings produced a very positive outcome by participants. The most prominent discourse used by participants to identify benefits of the new methodology was coded as shown in table 4.3 Respondents statements include: “such method gives a clear picture of my section objectives”, and “because it makes objectives more clear and visible”. An important outcome was related to performance elements where participants expressed their opinion referring mainly to ‘issues’ and ‘facilitates’ such as, “it gives us the opportunity to review tasks dependencies and it helps re-organizing upcoming tasks”, “it is important because it helps the team tackles issues immediately and at an early stage”, and “because it helps avoiding duplication and unnecessary work”. Operations and team elements fared high amongst responses for instance, “because it makes work practices in a timely manner (ex: routine) while, short cycles helps for re-prioritization”, and “it feels like working more as a team unlike the command & control imposition”. A new category entitled ‘Communications’ was developed to distinguish important elements that participants highlighted during the investigation. Participants cited arguments like “because it is always healthy to have regular discussions”, “it gives a space for discussions”, and “because it provides a means of two way discussions as opposed to direct orders”. With the exception of one, all participants agreed with the statement that the team becomes more effective if it decides how to work within work cycles. The only negative exception stated that “No, there should be a boss (for example, direct supervision) to make certain decisions.” On the other hand, the majority argued in favour of self-management such as, “Yes, because we are a good team, however more autonomy will yield better results”. 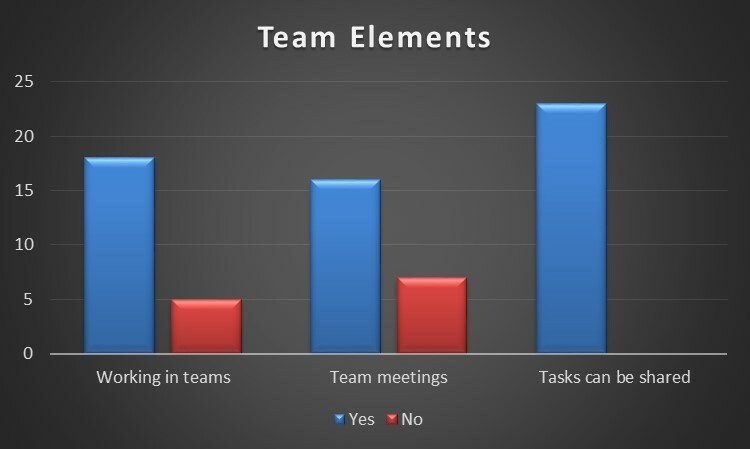 In view of self-managed teams and distribution of tasks according to skills, participants stated very clearly using discourse such as, “Yes because we (members) know how best tasks should be done and how long they take”, “Yes, because team members can share tasks relevant to their skills”, and “Yes because it makes you take tasks more relevant to your skills and hence, can be more effective”. 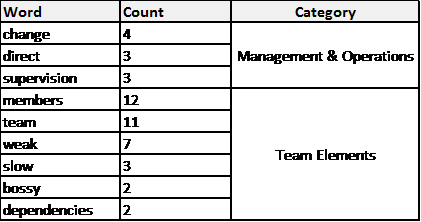 Data relevant to other codes was placed under the respective categories (Performance and Teams elements) during the analysis. The following were typical discourse instances: “assuming team members are mature and knowledgeable in their respective fields, then they would be more effective”, “because the team aspect helps share tasks according to skills in a better way”, and “because it helps increase team members relationships via sharing and transparency”. 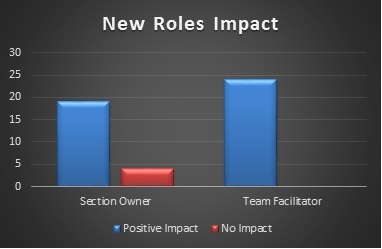 Below is a graphical and quantitative representation of participants’ replies about the impact of a section objectives owner and a team facilitator would have on their work and section performance. In view of the overlapping scope of other questions there was no need to elaborate further on this question. The introduction of a team facilitator as suggested in Agile scenarios was received very positively by all participants. The same was the case for the introduction of a section objectives (product/service) owner role, however, four participants were unsure whether it may or may not have an impact on the section performance. The main focus here was directed towards obstacles and issues removal and whether participants feel that this new approach makes them more productive or not. 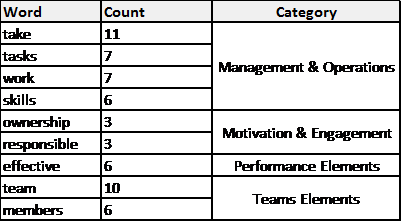 In a way all other categories have features related to operational performance and as already stated due to the overlapping scope of each category, I had to focus on specific elements during each category analysis. The part of the obstacles removal process of Agile triggered a sense of waste removal or saving time for more important tasks among participants. In fact, the most prominent words as depicted in table 4.5 demonstrates a great deal of issues and unproductive routines that if removed would make any team more focused on useful tasks with the prospect of achieving more productive work for the section. In general the discourse used by participants concentrated on unproductive and unconnected work such as: “Yes it saves time from unrelated work”, “since it saves you from chasing after external staff”, “because it reduces distractions unrelated directly to work”, “because it frees me from distractions that affect my work”, “because we waste a lot of time on these issues/obstacles”, “because it saves me time chasing people to fix problems outside my remit”, and “because I can focus more on my relevant work”. The other element dealt with in this part was explicitly whether participants feel more productive using this approach. 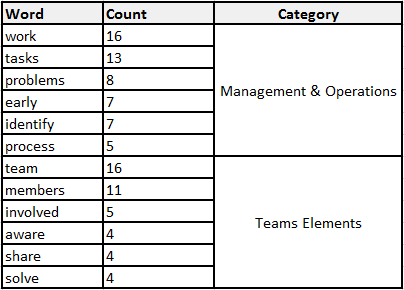 Various codes emerged, which were grouped under Management and Operations, Performance and Teams categories. Only one participant was unsure about this relationship and stated “I am trained to produce a certain output hence, I am not sure”. On the other hand, the most prominent discourse of those in agreement concentrated on features such as, sharing, skills, process amongst others: “Yes, because it makes members share work and tasks according to their abilities and strengths”, “Yes because it allows me to produce more output”, “Yes because I am already productive but this definitely improves things”, “Yes, because it is a more organized process”, and “because of the sharing of workload and skills”. 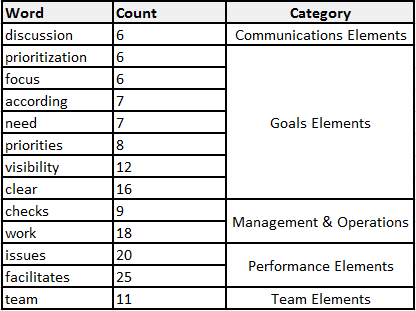 The Team’s category has a very vast scope as it overlaps with other areas in terms of communications, operational practices, self-management and goals. Here, the focus is on Agile team elements such as, team influence on sharing tasks, team influence on motivation and engagement, and interactions between team members. Figure 4.7 depicts the most prominent words which led the analyses in relation to Teams’ elements. The desire towards team spirit appeared to be very strong among participants and this reflected on the most common elements referred to by participants. These mainly fell under Management and Operations, and Teams elements of the pre-determined categories hence, there was no need to create new categories. When confronted with the question whether the new methodology allowed more space for sharing of tasks and knowledge within the team the study produced a notable outcome. Such as: “Yes, it creates a bond since each member is involved”, “because it makes everyone aware of what’s going on”, “because of the team concept, given that team members work together”, “Yes because it creates more discipline, it helps identify problems at an early stage and helps the team become more united, I mean team spirit”, “Yes and knowledge exchange at the same time” and “it improves sharing of tasks”. On the other hand, certain participants holding higher grades admitted that the reality of their roles does not allow them to share everything: “No, due to specialization it is difficult to share certain tasks”, and “Yes, but not specific tasks related to my role”. When confronted with whether participants see any benefits by doing a daily Agile team meeting with the presence of the team facilitator, most participants stated positive elements. Only two stated that a daily meeting is too frequent. Mostly, see benefits of a short daily meeting because: “it makes everyone aware of what’s going on”, “it helps rectify dependencies issues or at least raise awareness”, “it gives more visibility of overall tasks and progress”, “it helps trash problems as early as possible”, “it gives a clear picture of tasks and work being carried out”, “it is kind of a brainstorming session”, “also you are aware of every member’s tasks”, “it makes the team facilitator aware of issues and can intervene”, and “because of the sense of communications”. A prominent reply was “it helps identify problems at an early stage”. Tested for motivation and engagement with respect to the new way of working, below is a quantitative analysis of the participants’ responses. Only 6 did not feel any change with respect to their engagement and motivation if using the Agile approach. However, most participants expressed themselves positively, stating reasons such as: “I feel better when sharing load while doing my tasks. I feel more trusted with increased autonomy and hence, more motivated”. This part of the investigation focused on assessing participants’ opinion on key issues if the public service opted to implement the new methodology. It engaged participants to play the role of advisors putting forward their recommendations based on the knowledge they acquired from the previous parts. This phase started with testing which current and existing public service roles, participants see fit as objectives owner and as team facilitator. Figure 4.9 below, displays that the majority of participants linked the current Director and Assistant Director roles to the section objectives owner and team facilitator Agile roles. Next, participants were asked whether the new approach is attainable or not within the context of the public service. Their pertinent responses indicated that the design of the qualitative interview had stimulated their thought and engagement with the new methodology, producing an outcome that demonstrates that they understood the concept very well. 17 participants argued that the new methodology is feasible while, 6 had some reservations. The main attribute derived from the positive replies was the need for a change. The need for a change in the public service culture, attitude, and structures were the main codes that emerged from this part of the analysis. The main arguments made by participants include: “Yes where appropriate, that is where staff is complacent”, “Yes, to overcome the existing culture”, “Yes because there is a need of a push, a change”, “Yes but it may be a bit difficult because of the culture of status quo”, and “Yes, it works where employees are self-motivated and willing to work in a team and it depends on attitudes not sections”. Those that expressed total agreement stated: “Yes, I see no major problems” and “Yes in my section it works”. The 6 participants who had reservations about this subject, attributed their negative responses to the same attribute (culture issues). This illustrates that culture is the main attribute but most participants see the new methodology as a means to a culture change while, few see it as a barrier to the introduction of Agile in the public service. Statements such as: “No because of public service culture” and “Don’t know, I am happy with the status quo” were two specific findings which are discussed in the next chapter. Subsequently, participants were asked to highlight what advantages and disadvantages, if any, the new methodology would bring to the public service context. Analysis of the codes derived from arguments made by participants fitted perfectly in the pre-determined categories of this concept-driven procedure. Elements categorised under the management and operations classification represent the coordinated process of performing tasks. Participants argued: “the process is more structured, clear and helps remove uncertainties”, “better coordination and efficiency”, and “achieving targets according to set timelines (ex: work cycles), less overlapping of tasks due to more visibility and balance of work load”. Team, Goals and Performance main arguments included: “team work”, “protection from distractions, transparency and awareness of what’s going on in the section”, “this approach may produce more output, and its timely manner of doing things/structured process”, “performances, deadlines and tasks are achieved better through a standard approach” and “delivery of tasks in a short time frames”. Two new categories were added due to their important elements related to motivation and engagement, and communications which are also considered as two important features of Agile. Participants’ most prominent discourse included: “The motivational aspects, as I see elements of team building”, “the introduction of targets such as, timing of tasks and achievements”, and “the team work and communications aspects”. According to participants, the main disadvantages feature the risks of weak, slow or dominant team members. Other risks were mentioned including resistance to change such as: “Staff resisting change”, “Difficult to change culture in public service”, “Resistance to change, team members different personalities may raise insecurity concerns”, and “culture change”. Uncooperative or unskilled team members is discussed in the next chapter, however, the following were the main arguments: “weak members and the lack of direct supervision”, “weak and unskilled members”, “weak/low performers or members not ready to work in a team”, “the weak or uncooperative members in a team”, and “dependencies on other team members to achieve tasks”. Consequently, participants were asked whether they agree with a team performance appraisal system over an individual one. Quantitative analysis of the qualitative data are shown in figure 4.10. 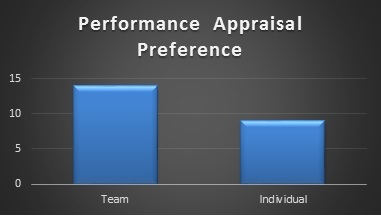 Those in favour of a team approach argued: “because the team should be rewarded”, “because it represents a team effort and instigates members to work as a team”, “after all it is a team performance”, “because it removes subjectivity (individual relationship between appraiser and staff)”, and “because at the end it is the team that achieve goals”. While, those in favour of individual approach argued: “no, I want my performance appraisal based on my individual achievements”, “no because not all members perform equally”, and “no, individually is better because of weak members”. A final practical comment was: “both, first team and then individually”. In this chapter I presented the reaction of participants in response to the contrasting and innovative approach to public administration that this research aims to study. Through the semi-structured interviews, Agile concepts within the context of the public service could be explained better and in more detail, hence why the qualitative approach was deemed more appropriate. In the next chapter I will discuss and elaborate further on these findings in order to provide additional insight from a holistic point of view.